Hurry Spring fishing HOT now! Cabin Sleeps 6. CHEAP! FREE WIFI and Boat Slips! 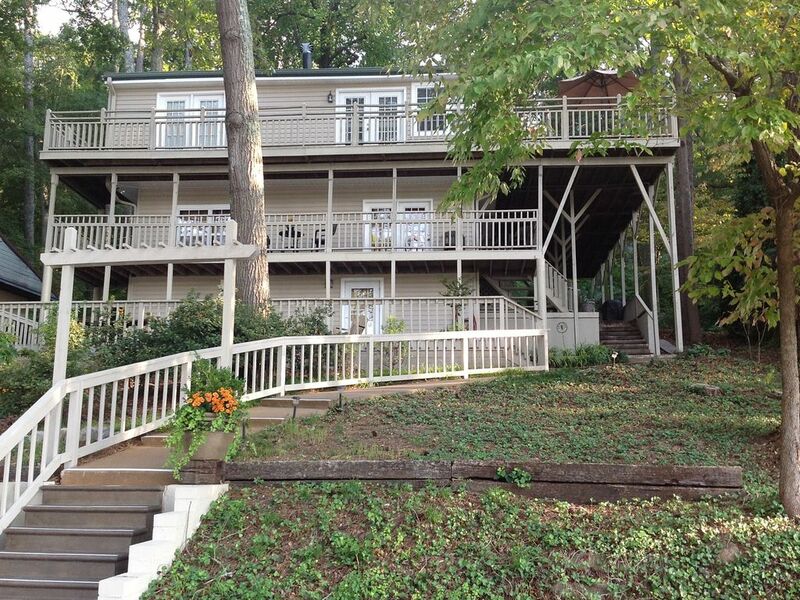 Situated on Polecat Hollow on beautiful Lake Guntersville, AL, this charming cabin offers complete rest and enjoyment. Only 1 mile from downtown Guntersville so convenient to all restaurants and shopping. The cabin is condo-like in that it has a separate unit on each floor. The Rental unit featured here is the original cabin - the entire MIDDLE floor - with magnificent views - right on the lake. Every unit is self-contained with private entrance, balcony and large patio. Very clean with all the comforts of home. Plenty of parking for boats. ONLY 5 MIN TO LAKE GUNTERSVILLE STATE PARK. FREE Private boat slip inside boathouse with electrical. Fishing pier with 8-10 feet of water at dock. Public boat launch within view just across the lake. FREE WIFI! Polecat Palace (middle floor): This listing only! Bottom floor rents with separate listing - See VRBO Listing #881638. Top Floor also rents with separate listing - See VRBO Listing #1298844 or Call for details. The listing featured here (entire middle floor) includes 2 Q Bedrooms, 2 twin beds in Great Room, 1 BA, fully equipped eat-in kitchen, wood-burning fire-place, private deck and entrance, sleeps 4-6. Free covered boat slip with electrical! Wireless Internet, Firewood, charcoal grill, washer/dryer, linens and towels, and much more. Mark and I (Libby) have been making our family vacation home available to the public when our family does not use it which seems too often these days. We have one child - Nicholas - a dog and cat. One of our favorite things to do is hiking - the state park is only 5 miles away and has some great trails. Of course eating and shopping in quaint downtown are much fun. We love having guests visit our cabin and have convenient methods for checking in and paying rental fees. Guntersville is a neighboring city to our hometown, Albertville. Almost all water and surrounded by the foothills of the Appalacians, it must be one of America's best kept secrets - sleepy but absolutely breathtaking. The views are amazing here. The cabin is on a mountain side sort of and the upper floors are especially good for viewing the water and mountains. The boathouse with free boatslip is still only 50 feet away.) This place is all about outdoor life with water sports, cooking out, and general fun with friends and family. Full Size Bath with tub and Shower. Plenty large enough for everyone. The view of the water agains the backdrop of the mountain range is spectacular. Water only approximately 50 feet or so from the cabin! Use of 2-slip boathouse included in rental w 8 ft width max. - 1 possibly 2 slips available for this unit - FREE!. First come first serve. The cabin has a great view of the lake. I would recommend this cabin. I would recommend this cabin. We enjoyed our stay and plan to be back. The location is great snuggled in the trees and still on the beautiful lake. Easy access to restaurants and grocery stores. Cozy place next to the water! Nice place if your looking for a less expensive get away option. Beware this is three rentals in one and parking may become scarce. My four kids and I stayed on the second flour of this nice riverside house. It isn't brand new place, but it was clean and had everything we needed in each room to survive for two days. The owner is very friendly, she told us how to get to places we wanted to visit. Beds were comfortable, but I really missed my pillow...My girls had theirs, so they have nothing to complain about, except for loud birds choir in the morning ! My boys were happy to play basketball on the playground in 5 min walking distance. Little steep driveway in the rear with roomy space to park a car. You can go shopping, dining, hiking, swimming, fishing, boating, zip-lining, cave exploring, sun-set catching all in a range of 30 min of drive! I absolutely loved our stay at Polecat Place. I have severe allergies and tend to have problems in environments with dust, but I had virtually no issues here. It was spotlessly clean, stocked with everything we needed, and was really close to nearby restaurants and grocery stores. Perfect stay- I would recommend to anyone. My elderly dad and I really enjoyed our stay, If your looking for convenience, mixed with southern hospitality, along with a great place to fish this is the place. The owner is excellent and she made sure we felt at home. The lower unit is comfortable and the covered boat house was a great benefit. However remember to bring bumper buoys for your boat the skiing community, of an evening, keeps the waves going. Located approximately 1 mile from downtown Guntersville with lots of great shopping and restaurants. Salvage shopping our favorite. Don't forget to hike or ZIP at the nearby State Park, Water sports are the best right at the cabin! We have additional smaller unit (bottom floor) sleeps 2-4 starts at $95/night. Call or look for separate listing with VRBO to book online. Pets are allowed! However the pet fee will not calculate correctly with the online quote/booking so amount will be updated with confirmation. $20/night/pet with $35 additional cleaning fee.